Kellogg's Start the Day Whistling Ad 1934 This is a July 1934 advertisement It is a nice black and white ad for Kellogg's of Battle Creek. Pictures a young boy wearing bib overalls and wearing a straw hat, with fishing pole and he is whistling. Bird perched in tree is singing and it reads, Start the day Whistling. Box reads Kellogg's Corn Flakes. In mint condition. Photo is taken through plastic and may show wrinkles or crookedness that is not in the ad. This magazine tear sheet measures 6 1/2"" wide by 10"" tall. 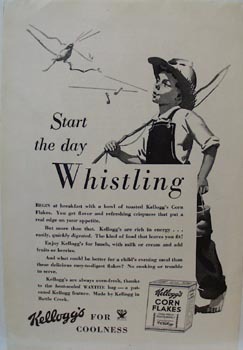 Items Similar To "Kellogg's Start the Day Whistling Ad 1934"
Kelloggs men are strong for em Ad 1956.